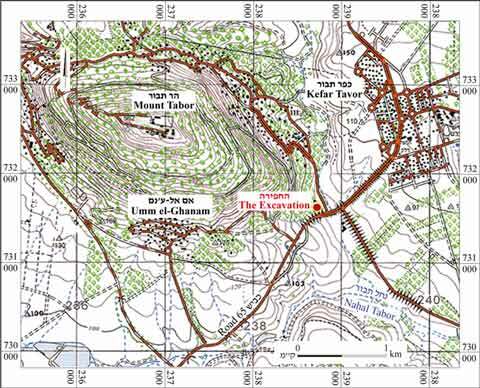 In December 2013 and January 2014, a trial excavation was conducted west of Highway 65, near ‘Ein Umm el-Ghanam, at the foot of Mount Tabor (Permit No. A-6970; map ref. 238395–410/731195–219; Fig. 1), after antiquities were discovered in trial trenches dug prior to the installation of a gas pipeline. The excavation, undertaken on behalf of the Israel Antiquities Authority and financed by the Israel Natural Gas Lines Company Ltd., was directed by Y. Tepper (field photography), with the assistance of Y. Lavan, Y. Ya‘aqobi and E. Bachar (administration), T. Meltsen (surveying), A. Shapiro (drafting), H. Tahan-Rosen and L. Zeiger (artifact drawing), Z. Matskevich (lithics), Y. Kupershmidt (metallurgical laboratory), D.T. Ariel (numismatics) and laborers from Kafr Manda. Two excavation areas (A, B; Figs. 2, 3) were opened near an abundant spring, on both sides of a streambed that runs to the southeast and empties into Nahal Tavor. Two squares were excavated in Area A, located north of the streambed and next to the spring. Flint tools and industrial debitage from the Middle Paleolithic period were discovered (Matskevich, below), as well as ceramic finds from the Iron Age II, a wall and an adjacent level of potsherds dating to the Hellenistic period and a stone heap. One square was excavated in Area B, south of the streambed, where a modern stone heap was revealed. Potsherds dating to the Roman and Ottoman periods were discovered on the surface. Area A (Fig. 3). A curved wall (W108; in excess of 6 m long; Fig. 4) was exposed in the western part of the area (Sq A1) at a depth of c. 1.5 m. It was built of medium- and large-sized fieldstones that were set on bedrock with smaller stones in between, and was preserved to a height of two–three courses. Bedrock was exposed west of the wall (L104). 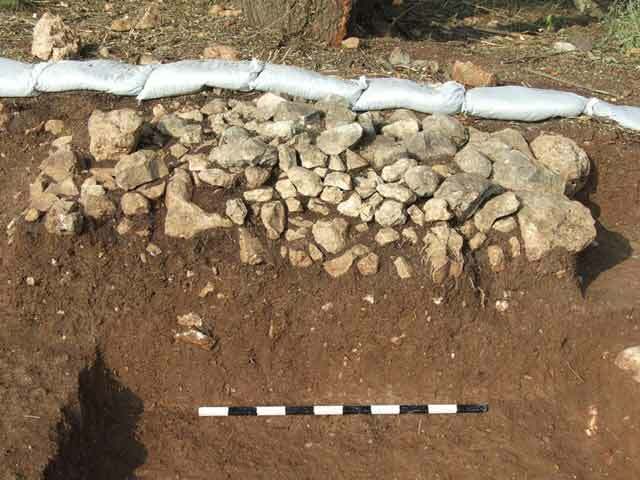 Slightly above the bedrock to the east and northeast of the wall was a layer of dark gray soil (L106, L107) containing small stones and potsherds dating mainly to the Hellenistic period. 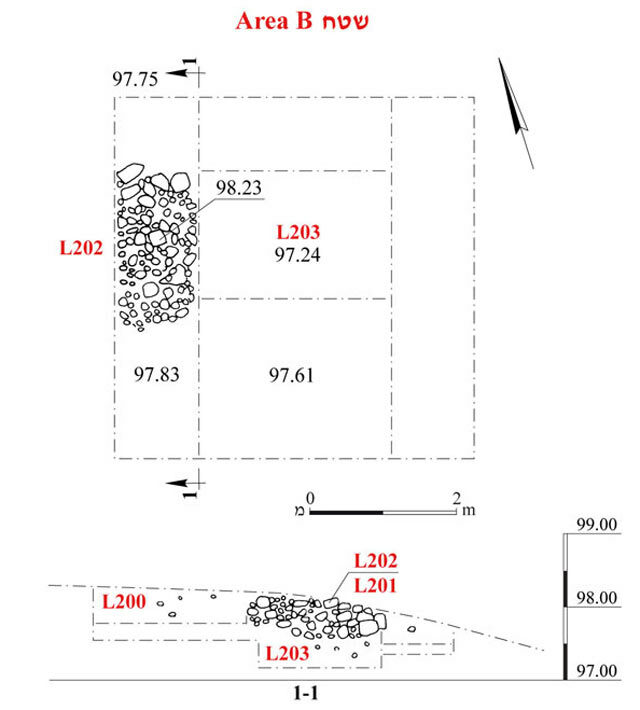 A stone heap (L109; c. 0.5 × 1.5 m) was exposed in the eastern part of the area (Sq A2); it was excavated down to bedrock, yielding a meager amount of potsherds (L102). The ceramic artifacts discovered in its western part include a cooking pot (Fig. 5:1) and two jars (Fig. 5:2, 3) dating to the Iron Age II. A krater (Fig. 5:4) and two jars (Fig. 5:5, 6) dating to the Hellenistic period were found in the layer of soil next to W108. Several potsherds from the Roman and Ottoman periods (not drawn), as well as a fragment of a basalt grinding stone (Fig. 5:7) and a coin of Constantius II (351–361 CE; IAA No. 143889) were discovered in the topsoil. Area B. A stone heap (L109; c. 1.5 × 3.0 m; Figs. 6, 7) piled on top of sterile soil (L203) was discovered. Several flint items (Matskevich, below) and pieces of a modern metal tool were found in a section excavated widthwise across the heap (L202). The lithic assemblage from the excavation comprises 134 items that were collected without sifting. Of these, 129 items were discovered within the surface level and in the Hellenistic layer in Area A. All of the items in the assemblage were made on fine-quality, beige and brown flint of the Eocene Epoch, which probably came from the immediate vicinity of the site. Most of the items were abraded and covered with a thick layer of patination, and many are damaged on their edges. The assemblage includes 36 tools, 15 cores, 67 debitage items and 16 chunks, most of which are characteristic of the technology and typology of the Middle Paleolithic Mousterian culture. In addition, one small coarse, asymmetric bifacial (handaxe) that probably dates to the Lower Paleolithic period was discovered. One of the lateral sides of the tool was fashioned with transversal blows, similar to the bifacial knives known from the Acheulean-Yabrudian culture in Tabun Cave in the western part of Mount Carmel. 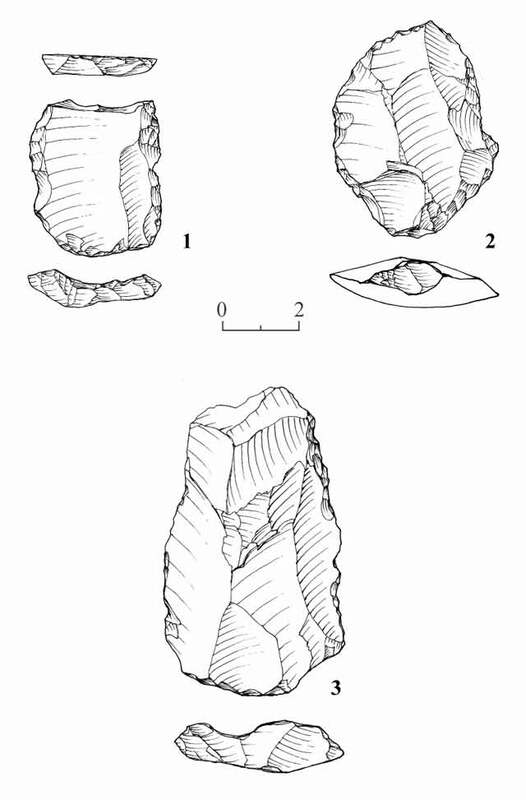 Also discovered were two scrapers that were in a similar state of preservation as the rest of the lithic assemblage; they probably post-date the Middle Paleolithic period. The items characteristic of the Mousterian culture were knapped using the Levallois technique. Of the 15 cores, five were knapped with the Levallois technique, two are discoidal cores and the rest are amorphous cores. A recurrent centripetal removal pattern isapparent on three of the Levallois cores, a centripetal preferential pattern on one of the cores and unidirectional recurrent removals are apparent on one of the cores. The core debitage gathered at the site is typical of the Levallois technique (éclat débordant and éclat ultrapasse). The frequency of side scrapers in the tool assemblage is remarkable; they include 11 convex side scrapers, a double convex side scraper (Fig. 8:1), a concave side scraper and a convergent side scraper. Four of the side scrapers are fashioned on Levallois flakes. The tool assemblage also includes four retouched Levallois flakes (Fig. 8:2, 3), a retouched Levallois point, four notched items, four denticulates, three naturally-backed knives, one Nahr Ibrahim tool and one retouched flake. The flint items found in the excavation indicate the presence of occupation from several prehistoric periods, particularly during the Middle Paleolithic period. The proximity to a source of water and available raw material served as a catalyst for settling there, as it was for other sites in the region, among them the Mousterian site on Jebel Qafzeh near Nazareth. 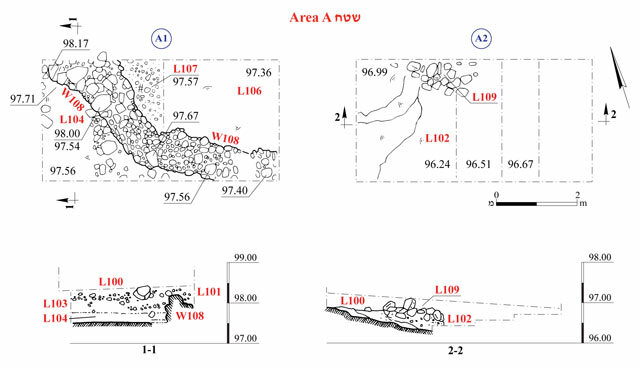 Another similarity between the excavation site and the Jebel Qafzeh site is the several typo-technological characteristics of the flint assemblage, among them the preference for Levallois flakes and the centripetal mode of core exploitation. 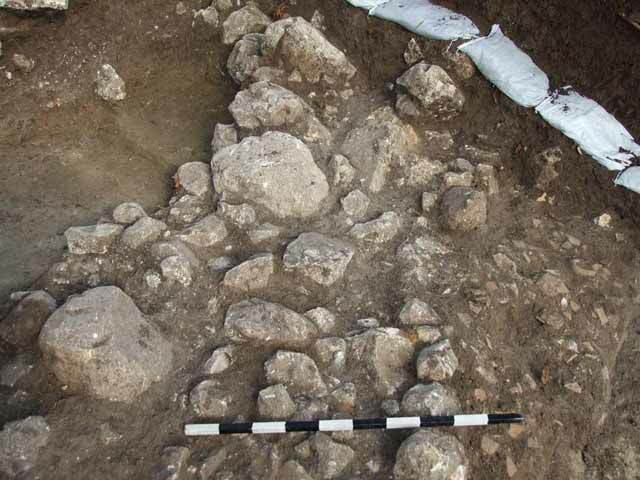 In the current excavation, remains of human activity dating to the Middle Paleolithic period were revealed near a source of water on the eastern slopes of Mount Tavor, at a site that was not previously documented in surveys conducted in the region. 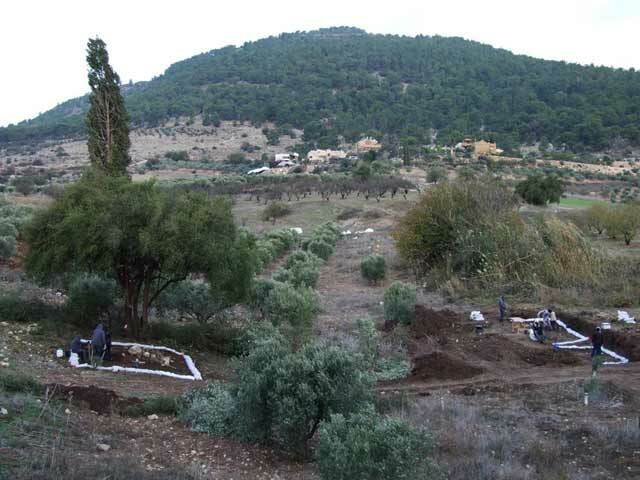 There was also activity at the site in the Iron Age II, Hellenistic, Roman and Ottoman periods. On the basis of the remains discovered, it seems that activity was most intense during the Hellenistic period. 2. Area A (right) and Area B (left) against the backdrop of Mount Tavor, looking west. 5. Area A, pottery and stone artifacts. 7. Area B, a section excavated in the stone heap, looking northwest.